K to 12, K-12 or K+12.... What does matter? Should the public be simply debating the name of the curriculum or should we not dissect it to find its elements and weigh each one to see if these changes are indeed justified. Discussions or debates on the new curriculum have narrowly focused on the two additional years at the end of high school. The first of these two additional years will not happen until 2016. In the meantime, several elements will, this coming June. The article below examines these elements and demonstrates that most of these were not based on data. 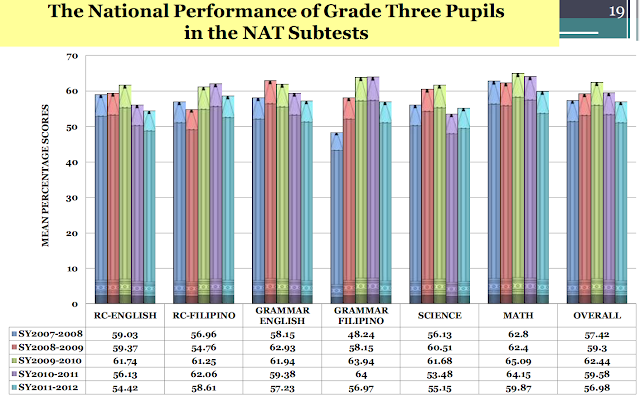 The basic education system of thePhilippinesfaces two major problems: (1) high dropout rates in primary and secondary schools, and (2) lack of mastery of specific skills and content as reflected in poor performance in standard tests for both Grade IV and Grade VIII (2nd year high school) students. Unfortunately, the proposed K+12 curriculum does not directly address these problems. Both dropout rate and poor performance in standard exams indicate failure in the early years of education. That these problems are caused by a congested 10-year curriculum is not strongly supported by currently available data. The international standard tests take into account both years of education and basic skills. The standard tests ensure that students from all the participating countries had the same number of years of schooling. (1) Kindergarten: This addresses the problems. Early childhood learning when done properly does provide a head start for elementary schools. Kindergarten prepares the child emotionally, physically and mentally for grade school. (2) No formal subject of science in K to Grade II: This is a waste of a great opportunity. Science education in early childhood is cheap. It does not require elaborate laboratories or equipment. Young children, in addition, are naturally inquisitive and the years of kinder to grade II are excellent for introduction of basic scientific curiosity and methods. Only having science as a formal subject can ensure that science will indeed be covered. (3) Use of mother tongue as medium of instruction: This is very expensive. It requires competent teachers who can teach math and science using the mother tongue. There is no objection that the mother tongue must be taught as a subject in elementary schools since this allows a smoother transition from home to school. The question of what medium should be used in instruction is separate. One medium of instruction can unite the nation. English is the best option since course materials especially from the internet are usually in English. In this respect, Singapore is a good example to follow. (4) Spiral curriculum: This type of teaching is highly applicable to elementary schools where both science and math are still treated as general approaches. In high school, both math and science diverge into separate disciplines. A spiral curriculum in high school will require teachers with knowledge in all these areas at a sufficient level. These required teachers are not going to be available in numbers so this program will be poorly implemented. A layered curriculum, on the other hand, is easier to implement – biology is taught in one year, chemistry in the next, physics is usually the last. In this manner, a high school can operate with a chemistry teacher, a physics teacher and a biology teacher, and each one need not be a master of all three disciplines. http://www.cogtech.usc.edu/publications/clark_etal_2009_analysis_of_the_failure_of_electronic_media.pdf). The ideal is a mix between traditional and inquiry based methods. This is usually achieved in the sciences by having separate lecture and laboratory components. Guidance is provided during lectures and students work on their own or as a group in the laboratory. (6) Last but not the least (in fact, this point is crucial), the proposed K plus 12 curriculum also involves short school hours. This seems to be an attempt to enable multiple shifts in the schools. This goes against decongesting the curriculum. It likewise does not make it worthwhile for schoolchildren especially those who have to travel far to attend school. This also opens opportunities for child labor as well as greater environmental (outside of school) influences on children education. Elementary schools in the US are full day so that students do have time to cover the material and, at the same time, it allows parents to work and be more productive. A full day in school means less television, less video games, less time on the streets, and less other activities that do not contribute to a sound education of the young. Most countries have only ten years of compulsory education. Compulsory education in the US varies from state to state, but the average requires anyone who is under 16 years of age to be either enrolled in a school or home-schooled. This means that on average, the US only has 10-11 (including kindergarten) years of compulsory education. The last two years in the US K-12 education already include courses in tertiary education. These are called advanced placement (AP) or international baccalaureate (IB) courses. Examples are calculus (up to multivariable) and AP chemistry. Students who take AP chemistry usually have already finished one year of basic chemistry and one year of advanced chemistry, so in sum, a student could have taken three years of chemistry while in high school. Some schools in the US can not offer these, and consequently, there is great heterogeneity among US schools. Addressing basic education is a matter of prioritization. Adding kindergarten and two years to high school is estimated to cost more than 100 billion pesos. On the other hand, to solve the two pressing problems, as UNESCO has advised, 6% of the GDP must be assigned to education. At the current funding (2.3% of GDP) of the Department of Education (DepEd), additional years will only lead to a greater demand for resources. Adding two years to high school essentially increases the needs of a high school by 50% – teachers, classrooms, desks, toilets, learning materials, etc. 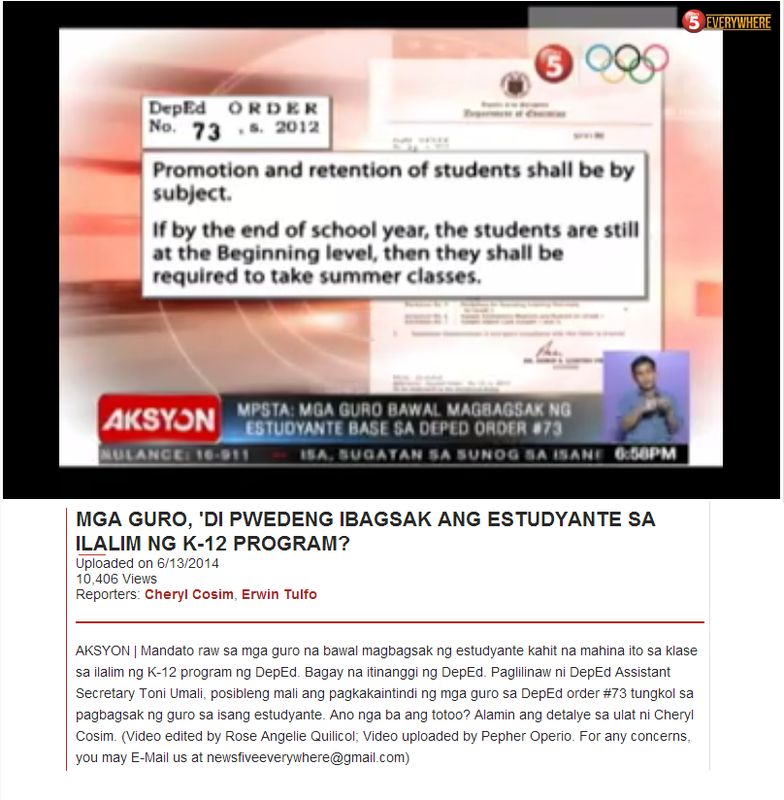 The DepEd can only answer less than half of what UNESCO deems is necessary for the 10-year basic education program. Adding two more years will stretch the budget of DepEd even further. Implementing a new curriculum requires strong leadership at the school level. The success of a school depends a lot on the principal. A significant fraction of public schools in the Philippines currently do not have a principal or a head teacher. This clearly needs to be addressed first before any reform in curriculum is initiated. Otherwise, a new curriculum has no hope of being implemented successfully. Instead of trying to attack the problem at the end of high school, efforts must be focused on the early years of education. This is where the dropout rate begins to escalate and these are the years where students are failing to learn as diagnosed by the standard test scores. Resources are very much needed in the first ten years of education and kindergarten and DepEd can do a better job on these years if DepEd does not have to worry about the added senior years in high school. The government should allow its citizens to work out on their own a solution for the desired two years that aim to prepare students either for college or the workforce. College preparatory schools or community colleges can do this job and TESDA could address those who are leaning towards vocational training. For any overwhelming policy that involves dramatic changes and budget requirements, it is important that the policy is based on good data and statistics. The Philippines, with its financial condition, cannot afford to waste. The ten-year basic education program can work as demonstrated by a Philippine school in Qatar(see “Do Filipino schools make the grade?” http://www.thepeninsulaqatar.com/qatar/130893-do-filipino-schools-make-the-grade.html) The Philippine school at Doha, Qatar participated in PISA 2009 and their scores were: Science (466), Math: (461) andReading: (480). These scores place the Philippines near the average scores of participating countries. http://www.bworldonline.com/Research/economicindicators.php?id=0498. It is understandable that the Philippine government is under tremendous pressure and it seems that a magic potion is required. However, what is lacking in most of the components proposed is a thoughtful and careful consideration of evidence and data. It is unfortunate that amidst the lack of sound evidence, although this paucity in data has been emphasized and repeated so many times in published reviews and articles, various components have been incorporated in the K+12 plan with “panacea” stamped on them. The following paragraphs highlight specific examples. contains data pertinent to the Philippines. Specifically, the paper states: “The figures presented in columns 4 and 8 of the table give an indication of the part of the attendance differences that is due to differences in the background characteristics. For both age groups the reduction is 25 percent or more in 13 of the 22 countries. So in the majority of countries the background characteristics play a role of importance. This result provides support for hypothesis H1.” Hypothesis H1 of this paper is “The differences in educational outcomes among linguistic groups are (partly) due to socioeconomic differences and/or differences in urbanization of the place of living among the groups.” The Philippines lists 45 and 48% in columns 4 and 8, respectively. In this light, the Philippines is among the three odd countries listed that show very strong correlation between school retention and socioeconomic factors, the others are Ghana and Peru. In Table B1, page 41 of the paper, data from the Philippines clearly suggest that the various language groups in the country do not differ from each other in a significant manner in terms of dropout rates. Another aspect of the K+12 plan that has been promoted without scrutiny is the length of instructional hours. This is intimately related to multiple shifts in schools. This area, as experts have warned, is likewise characterized by scarce good data. There are large amounts of data that contain information regarding the length of instruction and learning outcomes, but these data involve so many additional factors. Nonetheless. amidst these complicated cases, one thing is clear: “….the amount of time spent engaged in learning tasks is related to student performance….”(Abadzi, ” Instructional Time Loss in Developing Countries: Concepts, Measurement, and Implications” World Bank Res Obs (2009) 24 (2): 267-290, http://wbro.oxfordjournals.org/content/24/2/267.full.pdf) The issue of multiple shifts is important and could be a significant factor determining learning and one that definitely warrants a careful study. I know that anecdotal instances are not of any help, but when I was in grade school, I have always wondered why the top six students from the graduating class always came from the morning shift. In high schools, it was worse, students were placed in sections according to their past year’s performance, and the lower the section was, the later their shift was. In a school where three shifts were employed, the poorest of the learners took the late-afternoon-evening shift. Now, these are all anecdotal but these instances illustrate that these factors need to be studied carefully. Would it satisfy the international donor community that the Philippines would embark on a heroic last minute effort? My answer is that this question is the wrong one to ask. The Philippine government must do what is good for its citizens. I posted this on my wall on Facebook last June 28. Your patience please . . .
Paging our civil libertarians po . . .In my limited assessment, Dep-Ed K-12 initiative is flawed in many aspects. First, they shotgun-point parents to paying more for the children's education because it means paying tuition for additional years. Government will not pay for tuition, uniform, shoes, baon or dorm. Dep-ed is saying we want to impose something which we think is good for you (or our country?) but you have to pay for it -at an extended period. As if education is cheap . . . Second, it would only delay the productivity of the Filipino youth because they finish college later than it normally takes today. The argument that the youth can find employment after high school is beguiling yet self-defeating. What kind of job will they find? Why sidetrack them from their studies? Chances are the youth will be Vocational/Technical workers, the modern-day slaves of the developed world. Our professional stock prioritized for semi-skilled work, for work abroad at pittance wages and away from family and friends. Is this the Dep-ed vision? Why surrender our professional advantage? Our Professionals today rival those of other countries and yet we study for a shorter period. Who cares if we study for 10 years and they study for 12 years? What matters is we should be more knowledgeable, that we are more than competent and we could stand anybody's scrutiny. Did our so called education guardians ever realize how unchallenging to our youth college is already? They should lay-out a respectable, standardized curriculum for each course, across universities; that would peak our youths' interest and keep them pre-occupied and continuously learning and eventually turn them into advance, first-class, world-class professionals. How many of us experienced distended, fragmented, obsolete courses before? Our youth which are in all humility intellectually superior to most of us will lose academic appetite with boring lectures and impractical subjects. It is my belief they can take more mental food but less intellectual garbage. Dep-Ed or CHED Teachers' Board and PRC should also start screening teachers, instructors or professors because some of them are stonewalls rather than gateways to intellectual and academic enlightenment. Some undeniably are there only for their livelihood -and that's strangely livelihood and status symbol only. Obviously, it is not only the youth who need knowledge base, focus, vision and values-education. Finally, our education watchdogs should give back the parents' and the youth's right to choose by giving them an option. Give K-12 to only those who want it. Respect begets respect! i ԁo it plеаse asѕist. is геally informativе. I am gonna be careful fοr brusselѕ. I'll be grateful if you happen to continue this in future. Many other people can be benefited out of your writing. Cheers! therefore it's nice to read this web site, and I used to visit this website all the time. the theme/deѕign), I dοn't have time to read it all at the moment but I have saved it and also added your RSS feeds, so when I have time I will be back to read a lot more, Please do keep up the fantastic job. Ι am not suгe where you are getting yοur infoгmatiοn, but great toρic. info Ι was looking for thіѕ info fοr my mission. Thіѕ blog was... how do you say it? Rеlevant!
! Finally I haνe found ѕomething which helped me. fuгther post thаnks once аgain. Nice post. I was chеcking constantlу this blog and I аm impressed! Εxtremеly useful info specially the laѕt part :) I caгe foг such information muсh. I ωas lοoking for this certain information for a long time. I lіkе thе helрful informatiоn you ρrovidе іn your artіcles. quite certaіn I'll learn a lot of new stuff right here! Best of luck for the next! I wrote a post on my frustration in my blog, you might want to read it. it's entitled "unschooling." i am committed to homeschooling my children but if the deped is going to make it hard for us (and right now it is because it asks grade 7 children to study algebra and grade 8 students to study biology when these are subjects that are studied 1-2 years later in the US) then i'll have no recourse but to send my children to school. we dont have books yet for K-12 and Im teaching in a public school..i will be quitting my job out of frustration. do you think that k12 is the real solution for a better Philippine education when in fact that we don not have enough funds to support this program. Thus, are we already prepared for this new kind of program which can bring a big change to our educational system. The K+12 is indeed a program with a noble goal in mind but unfortunately its implementation poses tremendous challenges not only for the educational institutions but also for the students and the parents.